Many of the fuel tanks at Craney Island were underground and leaking, with no way of capturing spills. As a result, the Naval Facilities Engineering Command - Atlantic Division (NAVFAC) decided to issue two separate contracts to update the underground storage tanks including a secondary containment system. The Craney Island Fuel Terminal in Portsmouth, Va., first opened in 1918 primarily for storage of aviation fuel, diesel fuel and lube oil. Operated by the Defense Fuel Support Point (DFSP), Craney Island Fuel Terminal is now the U.S. Navy's largest fuel depot in the continental United States. Storage includes 60 tanks, which are a combination of underground storage tanks (UST), and aboveground storage tanks (AST) in addition to over 100 miles of pipeline. The Fleet Industrial Supply Center (FISC) provides fuel, lubricants and fuel related service to approximately 256 fleet and industrial customers with an average throughput of 15 million barrels of fuel per year. The primary products on site are JP-5 jet fuel, JP-8 aviation turbine fuel, F-76 diesel fuel and lube oil. Many of the fuel tanks on site were underground and leaking, with no way of capturing spills. As a result, the Naval Facilities Engineering Command - Atlantic Division (NAVFAC) decided to issue two separate contracts to update the underground storage tanks with new aboveground storage tanks including a secondary containment system. 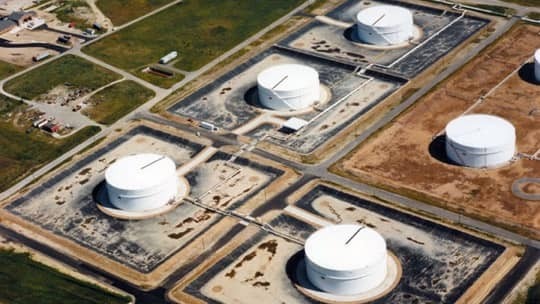 The first NAVFAC engineering contract was awarded in 1995 to Austin Brockenbrough & Associates in Chester, Va. Four new aboveground storage tanks for jet fuel were designed and installed. At that time, the Navy was using their Military Handbook for Petroleum Fuel Facilities (DM-22) which was written in 1982. In this design manual, there were no adequate guidelines for secondary containment systems around existing or new fuel tanks. Austin Brockenbrough specified a geosynthetic clay liner (GCL) as the dike liner for secondary containment with approximately 4 to 6 in. (15.2 cm) of soil cover. Unfortunately, with the limited amount of cover over the GCL, maintaining proper hydration within the clay was a major issue. In addition, maintenance crews have come in contact with the GCL with their grass-cutting equipment, thereby affecting the permeability and long-term performance of the clay. The second engineering contract was also awarded to Austin Brockenbrough in 1997 for four additional aboveground tanks adjacent to the existing ones. Each new tank was built on a concrete slab, which required more than 432 piles (14 in. by 14 in. by 105 ft. (35.6 cm by 35.6 cm by 32 m)). Also, each tank required 17.5 tons of reinforced steel, 1000 yds.3 of concrete and 550 tons of welded steel. Measuring 150 ft. (45.7 m) in diameter and 52 ft. (15.9 m) tall, each tank can hold up to 150,000 barrels of jet fuel. A reinforced 35-mil polyurethane geomembrane manufactured by Seaman Corporation was installed as part of the secondary containment system for the tank bottom. The polyurethane was reinforced with a 13-oz. nylon base fabric allowing for up to 1500 lbs. of puncture resistance (ASTM D-751 Ball Tip). The Corps of Engineers developed the guide specification for military tank bottoms from the collapsible fuel bladder or pillow tank market. The Corps wanted a geomembrane with broad petroleum resistance as well as high puncture and abrasion resistance. In addition, the maximum permeability required was 0.10 oz./ft.2/24 hours per ASTM E-96 using the Inverted Cup Method with ASTM Fuel B (gasoline). Each 150-ft. (45.7-m) diameter tank liner was fabricated and installed in two pieces with only one field seam for each tank. An interstitial space was placed above the geomembrane and below the new steel floor. This sloped sand layer provided leak detection with drainage to monitoring wells located on the sides of the tanks (Figure 1). The tank bottom system was also designed to allow for tracer tests. Since the diked area around the 4 tanks totaled over 20 acres, Austin Brockenbrough decided to use a fuel resistant geomembrane liner in lieu of concrete. In addition, the cost of installing concrete over such a large area would have been more than double the cost of a reinforced liner system. Using the updated MIL-HDBK-1022 as a guide, Austin Brockenbrough specified a 30-mil reinforced geomembrane with resistance to all grades of jet fuel including JP-4, JP-5 and JP-8. The geomembrane installed for the dike liners was an ethylene interpolymer alloy (EIA), 8130 XR-5®, manufactured by Seaman Corporation. Other liner selection criteria included low thermal expansion/contraction properties and the ability to prefabricate large panels, minimizing the number of field seams. The original dike liner design called for a 6-to-8 in. (15.2-to-20.3 cm) soil cover with grass over the geomembrane. With maintenance issues at the previous tanks, the engineer decided to eliminate the soil cover and leave the geomembrane exposed. This would eliminate the need for maintenance crews to cut the grass. Also, if there is a fuel spill, clean-up costs will be much less since there would not be any contaminated soil or clay to dispose of. clay, spray-on polyamide, non-reinforced geomembranes and reinforced geomembranes. An exposed 30-mil reinforced fuel resistant liner had the largest life cycle savings in lieu of concrete ($1.7 million). Access roadways made of concrete were constructed for vehicular traffic coming into the diked area as well as around the perimeter of each tank (Photo 3). The EIA geomembrane liner was placed underneath the concrete roadways and mechanically battened to the ringwall around the tanks. Drainage areas were placed in each dike with an oil / water separator. The general contractor for the second set of tanks was Mid Eastern Builders, Chesapeake, Va. The project was completed on time and on budget ($18,000,000). The first two tanks became operational in March 2000 and the final two in September 2000 and were turned over for Fuel Terminal Operations. Each tank is capable of holding 6.3 million gallons of jet fuel, weighing more than 50 million pounds. As a result, 23 outdated 2.1 million-gallon underground storage tanks have been demolished. NAVFACENGCOM-Pacific Division. 1991. Value Engineering Report - Oil Spill Prevention Facilities P-072. Pearl Harbor, Hawaii. Sadler, Bruce. May 2001. Austin Brockenbrough & Associates. Chester, Va. Telephone conversation. Thompson, Alan. S. December 1999. F.I.S.C. Supply Chest. Volume 51, Number 23. URS Greiner. October 1996. Military Handbook - Petroleum Fuel Facilities. William Shehane, P.E., is a geomembrane marketing specialist for Seaman Corporation's Engineered Products Group, Wooster, Ohio. Reprinted from Geotechnical Fabrics Report, August 2001.